Bishkek (Kyrgyz: Бишке́к, بىشکەک; IPA: [biʃˈkek]; Russian: Бишке́к, tr. Biškék, IPA: [bʲɪˈʂkʲek]), formerly Pishpek and Frunze, is the capital and largest city of Kyrgyzstan (Kyrgyz Republic). Bishkek is also the administrative centre of the Chuy Region. The province surrounds the city, although the city itself is not part of the province, but rather a province-level unit of Kyrgyzstan. In 1825 Khokand authorities established the fortress of "Pishpek" in order to control local caravan-routes and to collect tribute from Kyrgyz tribes. On 4 September 1860, with the approval of the Kyrgyz, Russian forces led by Colonel Apollon Zimmermann destroyed the fortress. In 1868 a Russian settlement was established on the site of the fortress under its original name, "Pishpek". It lay within the General Governorship of Russian Turkestan and its Semirechye Oblast. In 1925 the Kara-Kirghiz Autonomous Oblast was established in Russian Turkestan, promoting Pishpek to its capital. In 1926 the Communist Party of the Soviet Union renamed the city as Frunze, after the Bolshevik military leader Mikhail Frunze (1885–1925), who was born there. In 1936, the city of Frunze became the capital of the Kirghiz Soviet Socialist Republic, during the final stages of the national delimitation in the Soviet Union. In 1991 the Kyrgyz parliament changed the capital's name to "Bishkek". Bishkek is situated at an altitude of about 800 meters (2,600 ft), just off the northern fringe of the Kyrgyz Ala-Too range, an extension of the Tian Shan mountain range. These mountains rise to a height of 4,855 meters (15,928 ft) and provide a backdrop to the city. North of the city, a fertile and gently undulating steppe extends far north into neighboring Kazakhstan. The Chui River drains most of the area. Bishkek is connected to the Turkestan-Siberia Railway by a spur line. Bishkek is a city of wide boulevards and marble-faced public buildings combined with numerous Soviet-style apartment blocks surrounding interior courtyards. There are also thousands of smaller privately built houses, mostly outside the city centre. Streets follow a grid pattern, with most flanked on both sides by narrow irrigation channels, watering innumerable trees to provide shade in the hot summers. Originally a caravan rest stop (possibly founded by the Sogdians) on one of the branches of the Silk Road through the Tian Shan range, the location was fortified in 1825 by the Uzbek khan of Kokhand with a mud fort. In the last years of Kokhand rule, the Pishpek fortress was led by Atabek, the Datka. In 1860, the fort was conquered and razed by the military forces of Colonel Zimmermann when Tsarist Russia annexed the area. Colonel Zimmermann rebuilt the town over the destroyed fort and put field Poruchik Titov as head of a new Russian garrison. The site was redeveloped from 1877 onward by the Russian government, which encouraged the settlement of Russian peasants by giving them fertile land to develop. The early 1990s were tumultuous. In June 1990, a state of emergency was declared following severe ethnic riots in southern Kyrgyzstan that threatened to spread to the capital. The city was renamed Bishkek on 5 February 1991 and Kyrgyzstan achieved independence later that year during the breakup of the Soviet Union. Before independence, the majority of Bishkek's population were ethnic Russians. In 2004, Russians made up approximately 20% of the city's population, and about 7–8% in 2011. Today, Bishkek is a modern city with many restaurants and cafes, and with many second-hand European and Japanese cars and minibuses crowding its streets. However, streets and sidewalks have fallen into disrepair since the 1990s. At the same time, Bishkek still preserves its former Soviet feel with Soviet-period buildings and gardens prevailing over newer structures. Bishkek is also the country's financial center, with all of the country's 21 commercial banks headquartered there. During the Soviet era, the city was home to a large number of industrial plants, but most have been shut down since 1991 or now operate on a much reduced scale. One of Bishkek's largest employment centers today is the Dordoy Bazaar open market, where many of the Chinese goods imported to CIS countries are sold. Though the city is relatively young, the surrounding area has some sites of interest dating to prehistorical times. There are also sites from the Greco-Buddhist period, the period of Nestorian influence, the era of the Central Asian khanates, and the Soviet period. The central part of the city is laid out on a rectangular grid plan. The city's main street is the east–west Chui Avenue (Chuy Prospekti), named after the region's main river. In the Soviet era, it was called Lenin Avenue. Along or near it are many of the most important government buildings and universities. These include the Academy of Sciences compound. The westernmost section of the avenue is known as Deng Xiaoping Avenue. The main north–south street is Yusup Abdrakhmanov Street, still commonly referred to by its old name, Sovietskaya Street. Its northern and southern sections are called, respectively, Yelebesov and Baityk Batyr Streets. Several major shopping centers are located along it, and in the north it provides access to Dordoy Bazaar. Erkindik ("Freedom") Boulevard runs from north to south, from the main railroad station (Bishkek II) south of Chui Avenue to the museum quarter and sculpture park just north of Chui Avenue, and further north toward the Ministry of Foreign Affairs. In the past it was called Dzerzhinsky Boulevard, named after a Communist revolutionary, Felix Dzerzhinsky, and its northern continuation is still called Dzerzhinsky Street. There is a Roman Catholic church located at ul. Vasiljeva 197 (near Rynok Bayat). 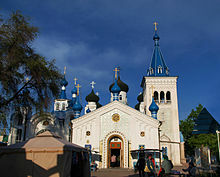 It is the only Catholic cathedral in Kyrgyzstan. Statue of Ivan Panfilov in the park near the White House. An equestrian statue of Mikhail Frunze stands in a large park (Boulevard Erkindik) across from the train station. The train station was built in 1946 by German prisoners of war and has survived since then without further renovation or repairs; most of those who built it perished and were buried in unmarked pits near the station. At Ala-Too Square there is an independence monument where the changing of the guards may be watched. Bishkek has both hot dry summer continental and mediterranean climate depending which isotherm would be used. (Köppen climate classification Csa/Dsa respectively). Average precipitation is around 440 millimetres (17 in) per year. Average daily high temperatures range from 3 °C (37.4 °F) in January to about 31 °C (87.8 °F) during July. The summer months are dominated by dry periods, punctuated by the occasional thunderstorm, which produces strong gusty winds and rare dust storms. The mountains to the south provide a natural boundary and protection from much of the damaging weather, as does the smaller mountain chain which runs north-west to south-east. In the winter months, sparse snow storms and frequent heavy fog are the dominating features. There are sometimes temperature inversions, during which the fog can last for days at a time. Emissions of air pollutants in Bishkek amounted to 14,400 tons in 2010. Among all cities in Kyrgyzstan, the level of air pollution in Bishkek is the highest, occasionally exceeding maximum allowable concentrations by several times, especially in the city centre. For example, concentrations of formaldehyde occasionally exceed maximum allowable limits by a factor of four. Responsibility for ambient air quality monitoring in Bishkek lies with the Kyrgyz State Agency of Hydrometeorology. There are seven air quality monitoring stations in Bishkek, measuring levels of sulphur dioxide, nitrogen oxides, formaldehyde and ammonia. Bishkek uses the Kyrgyzstan currency, the som. The som's value fluctuates regularly, but averaged around 61 som per U.S. dollar as of February 2015. The economy in Bishkek is primarily agricultural, and agricultural products are sometimes bartered in the outlying regions. The streets of Bishkek are regularly lined with produce vendors in a market style venue. In most of the downtown area there is a more urban cityscape with banks, stores, markets and malls. Sought after goods include hand-crafted artisan pieces, such as statues, carvings, paintings and many nature-based sculptures. As with many cities in Post-Soviet states, housing in Bishkek has undergone extensive changes since the collapse of the Soviet Union. While housing was formerly distributed to citizens in the Soviet-era, housing in Bishkek has since become privatized. Though single family houses are slowly becoming more popular, the majority of the residents live in Soviet-era apartments. Despite the Kyrgyz economy experiencing growth, increases in available housing has been slow with very little new construction. As a result of this growing prosperity and the lack of new formal housing, prices have been rising significantly – doubling from 2001 to 2002. Those unable to afford the high price of housing within Bishkek, notably internal migrants from rural villages and small provincial towns often have to resort to informal squatter settlements on the outskirts of the city. These settlements are estimated to house 400,000 people or about 30 percent of Bishkek’s population. While many of the settlements have lacked basic necessities such as electricity and running water, recently there has been a push by the local government to provide these services. Local government is administered by the Bishkek Mayor's Office. Askarbek Salymbekov was mayor until his resignation in August 2005, after which his deputy, Arstanbek Nogoev, took over the mayorship. Nogoev was in turn removed from his position in October 2007 through a decree of President Kurmanbek Bakiyev and replaced by businessman and former first deputy prime minister Daniar Usenov. In July 2008 former head of the Kyrgyz Railways Nariman Tuleyev was appointed mayor, who was dismissed by the interim government after 7 April 2010. From April 2010 to February 2011 Isa Omurkulov, also a former head of the Kyrgyz Railways, was an interim mayor, and from 4 February 2011 to 14 December 2013 he was re-elected the mayor of Bishkek. Kubanychbek Kulmatov was nominated for election by parliamentary group of Social Democratic Party of Kyrgyzstan in city kenesh, and he was elected as a new mayor on 15 January 2014, and stepped down on 9 February 2016  The next mayor, Albek Sabirbekovich Ibraimov, was also nominated for election by parliamentary group of Social Democratic Party of Kyrgyzstan in city kenesh, and he was elected by Bishkek City Kenesh on 27 February 2016. The current mayor is Aziz Surakmatov, who was elected on August 8, 2018. Bishkek city covers 169.6 square kilometres (65.5 square miles) and is administered separately and not part of any region. Besides the city proper, one urban-type settlement and one village are administered by the city: Chong-Aryk and Orto-Say. The city is divided into 4 districts: Birinchi May, Lenin, Oktyabr and Sverdlov. Chong-Aryk and Orto-Say are part of Lenin District. Bishkek is home to Spartak, the largest football stadium in Kyrgyzstan and the only one eligible to host international matches. Several Bishkek-based football teams play on this pitch, including six-time Kyrgyzstan League champions, Dordoi-Dynamo. Bishkek hosted the 2014 IIHF Challenge Cup of Asia – Division I. Public transportation includes buses, electric trolley buses, and public vans (known in Russian as marshrutka). The first bus and trolley bus services in Bishkek were introduced in 1934 and 1951, respectively. The city is considering designing and building a light rail system (Russian: Бишкекское лёгкое метро [ru]). 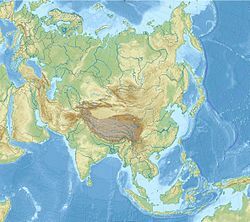 Long-distance regular bus and minibus services to all parts of the country, as well as to Almaty (the largest city in neighboring Kazakhstan) and Kashgar, China, run mostly from the newer grand Western Bus Station; only a smaller number run from the Eastern Station. As of 2007[update], the Bishkek railway station sees only a few trains a day. It offers a popular three-day train service from Bishkek to Moscow. In 2002, the United States obtained the right to use Manas International Airport as an air base for its military operations in Afghanistan and Iraq. Russia subsequently (2003) established an air base of its own (Kant Air Base) near Kant, some 20 kilometres (12 mi) east of Bishkek. It is based at a facility that used to be home to a major Soviet military pilot training school; one of its students, Hosni Mubarak, later became president of Egypt. ^ "Population of regions and cities of Kyrgyzstan in 2019". ^ Catholic Church in Kyrgyzstan. Catholic-kyrgyzstan.org. Retrieved 11 March 2012. ^ "Koppen Map". Upload.wikimedia.org. Retrieved 21 November 2012. ^ a b "Weather and Climate-The Climate of Bishkek" (in Russian). Weather and Climate. Retrieved 8 February 2015. ^ "Frunze (Bishkek) Climate Normals 1961–1990". National Oceanic and Atmospheric Administration. Retrieved 8 February 2015. ^ "Kyrgyzstan: Regions, Major Cities, Towns & Urban Settlements - Population Statistics, Maps, Charts, Weather and Web Information". citypopulation.de. Retrieved 6 April 2019. ^ "Ferdinand, S. & Komlósi, F. 2016. Vitality of the Kyrgyz Language in Bishkek". IJORS 5–2, pp. 210–226. Retrieved 10 September 2016. ^ Численность наличного населения городов, поселков городского типа, районов и районных центров СССР по данным переписи на 15 января 1970 года по республикам, краям и областям (кроме РСФСР) Archived 9 February 2011 at the Wayback Machine. Demoscope.ru. Retrieved on 11 March 2012. ^ "Население Кыргызстана | Перепись населения и жилищного фонда Кыргызской Республики 2009". 212.42.101.100:8088. Archived from the original on 15 September 2012. Retrieved 21 November 2012. ^ a b "Анализ загрязнения атмосферы". Nature.kg. Retrieved 21 November 2012. ^ Web-site of the State Agency on Environment Protection and Forestry: Assessment of Air Pollution. Meteo.ktnet.kg. Retrieved on 11 March 2012. ^ Roseman, Gary. "The Residential Real Estate Market in Bishkek, Kyrgyzstan". Real Estate Issues. Summer 2004. ^ Isabaeva, Eliza (2013). "Migration into the "Illegality" and Coping with Difficulties in a Squatter Settlement in Bishkek". Zeitschrift für Ethnologie. 138. ^ "New mayor of Bishkek promises to solve capital's problems". The Times of Central Asia. 17 October 2007. Archived from the original on 19 June 2008. Retrieved 18 October 2007. ^ Marat, Erica (15 October 2007). "Upcoming referendum sinks Kyrgyzstan deeper into crisis". Eurasia Daily Monitor. The Jamestown Foundation. 4 (190). Archived from the original on 22 October 2007. Retrieved 18 October 2007. ^ "Kyrgyz capital gets new mayor". Radio Free Europe. 22 August 2005. Archived from the original on 18 November 2010. Retrieved 18 October 2007. ^ "New Mayor for Bishkek". Lenta.Ru. 7 July 2008. Archived from the original on 18 November 2010. Retrieved 25 September 2008. ^ "Isa Omurkulov elected mayor of Bishkek". Radio Azattyk. 4 February 2011. Retrieved 10 August 2016. ^ "Isa Omurkulov resigned". Vecherniy Bishkek. 4 December 2013. Retrieved 10 August 2016. ^ "Kubanychbek Kulmatov elected mayor of Bishkek". Radio Azattyk. 27 February 2016. Retrieved 10 August 2016. ^ "Kubanychbek Kulmatov stepped down". Radio Azattyk. 9 February 2016. Retrieved 10 August 2016. ^ "Albek Ibraimov elected mayor of Bishkek". Radio Azattyk. 27 February 2016. Retrieved 10 August 2016. ^ Corporate Japanese companies to renovate Kyrgyzstan football stadium. The-afc.com (9 November 2007). Retrieved on 11 March 2012. ^ "International Ataturk Alatoo University". Iaau.edu.kg. Retrieved 21 November 2012. ^ "Главная Международный университет Кыргызстана.|". Iuk.kg. Retrieved 21 November 2012. ^ "Кыргызско-Российский Славянский университет имени Б.Н. Ельцина – Главная". Krsu.edu.kg. Retrieved 21 November 2012. ^ "Новости КНУ им. Ж.Баласагына". University.kg. 1 November 2012. Retrieved 21 November 2012. ^ "Kırgızistan-Türkiye Manas Üniversitesi". Manas.kg. Retrieved 21 November 2012. ^ "Plato UMD – Home". Umd.edu.kg. Archived from the original on 25 August 2012. Retrieved 21 November 2012. ^ "University of Central Asia – University of Central Asia". www.ucentralasia.org. Retrieved 23 February 2017. ^ "European School in Central Asia – Bishkek – Kyrgyzstan". esca.kg. 13 October 2014. Retrieved 13 October 2014. ^ "Oxford International School". oxford.kg. Retrieved 8 August 2017. ^ "Hope Academy of Bishkek". Hopeacademykg.com. Retrieved 21 November 2012. ^ "SRIS". SRIS. Archived from the original on 24 January 2013. Retrieved 21 November 2012. ^ "Frunze. City Encyclopedia". Retrieved 26 January 2014. ^ "Маршрут поезда ????? – ????? на сайте". Poezda.net. Retrieved 21 November 2012. This page was last edited on 19 April 2019, at 21:15 (UTC).